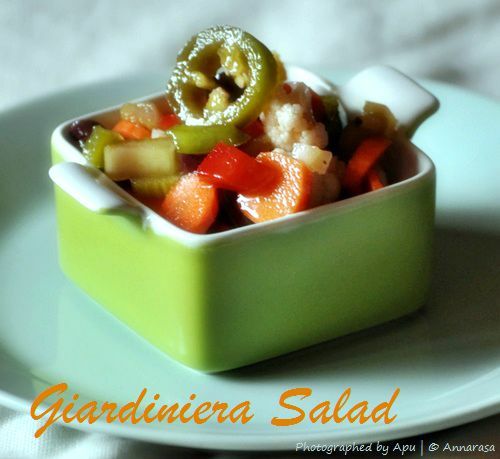 Giardiniera Salad is that delightfully spicy pickle that can wake up even the dullest of all sandwiches!! Every self-respecting deli and sandwich shop carries some version of this pickle. It's flavor can vary from just salty and sour to flaming hot depending on the kind of chili peppers that are in it. Cauliflower, carrots, celery, olives, and gerkins all pack this mouth watering salad pickle with loads of tang and flavor. In a large mixing bowl, combine the water and salt. Mix until the salt is dissolved. Add the carrots, cauliflower, celery, bell peppers, garlic, and jalapeno peppers. Stir. Cover and set aside for 6-8 hours. Drain the mix of the salt water and sit in a large colander for about an hour. Place the salted vegetables in a bowl, Add olives and seasoning. Stir to mix. Spoon the vegetable-seasoning mix into 2 large or 4 small jars. Top with vinegar and oils equally divided between the jars. Sit the jars open for 6-8 hours. Enjoy with salad, sandwiches, burgers, pizza, hummus, or just plain! Vegan, Nut Free, Gluten Free Recipe.